The Lakeside Country Club in Frimley Green has staged the BDO World Championships every year since 1986 and, for many, it is the traditional home of darts. In that time, 22 men have been lucky enough to win a final on the famous stage. England's Scott Waites has done it once before, but Sunday's final will be a new experience for Canada's Jeff Smith. 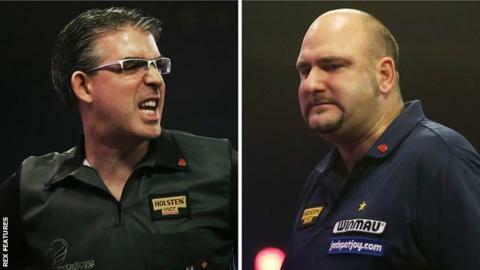 How do you emerge victorious from what is likely to be the biggest game of your darting life? With the help of three-time champion Martin Adams, we discover the key skills needed to win a World Championship final at Lakeside. Adams, 59, made his World Championship debut in 1994 and it was another 11 years until he got to the final, losing 6-2 to Raymond van Barneveld in 2005. "When I played my first final, I was already very familiar with the venue. It's become a home from home for me," says the player, nicknamed 'Wolfie'. "I've been involved in darts for more than 30 years and you learn different things from different players just through watching. You do pick things up along the way and, specifically here, how other players prepared for finals. "When you're coming into a semi-final or a final, you've got to make sure your game's right. "You've got to make sure you've had sufficient practice. You can't over-practise, but just make sure you've prepared well for your game." Adams has appeared in five Lakeside finals, winning the title in 2007, 2010 and 2011. He was also runner-up to Scott Mitchell in 2015. "You've just got to treat it like any other game you play," insists Adams, who was defeated in the first round this year. "We all know it's not and you're going to get the butterflies before you start, but once you get out there and you get your practice darts done, you should be set to rock and roll. "Every final after your first one is always different because you've got the experience of having done it before. "There's nothing that's really a surprise in the build-up to it. The first time, you're not quite sure what's going to go on and how you're going to react. When you've done three or four finals, you know exactly what's going on and you know exactly how you're going to react." About 1,500 people will be crammed inside Lakeside for Sunday's final between ninth seed Waites and unseeded Smith. "The British approach to a lot of sports is to back the underdog, so you might get the crowd saying: 'He's struggling so we'd better get behind him, give him a bit of encouragement and liven this match up,'" says Adams. "But the crowd are very important to you. They will support great darts, whoever's throwing them." Ex-England captain Adams led 6-0 against the late Phill Nixon in 2007 and looked certain to secure a convincing victory, only for Nixon to win six successive sets and take the final into a decider. Adams won 7-6 for the first of his three BDO titles. "No match is over until the final double has been thrown," adds Adams. "I won that final set 3-0 with a 54 checkout - 14, then double top." Waites, the 2013 champion, is in his ninth year at Lakeside and will be appearing in his second final, while Smith reached the semi-finals on his Frimley Green debut in 2015. The winner will receive a £100,000 first prize, as well as the coveted trophy. "Don't worry about what your opponent's doing. Just concentrate on your own game because there's only you that can throw your darts. Your opponent isn't going to throw yours for you," says Adams. "Lifting the trophy is what spurs you on, especially when you've done it before. I loved that bit. I loved the big cheque as well!" Martin Adams was speaking to BBC Sport's Phil Cartwright.